You have until May 30th to get trashed at the SpeakEasy Stage Company's latest production: THE GREAT AMERICAN TRAILER PARK MUSICAL! 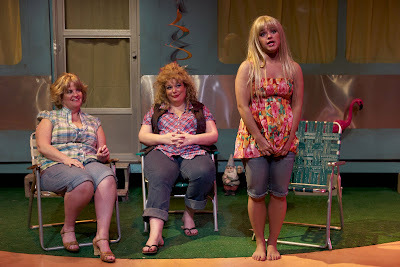 White trash has never been more entertaining! The show stars a bevy of Boston's best belters: Leigh Barret, Kerry A. Dowling, Mary Callanan, Santina Umbach (who nearly steals the show as "Pickles,") and Caitlin Crosbie Doonan. 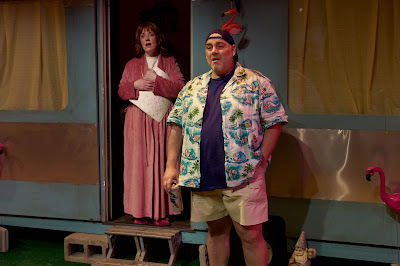 Together they trill the tacky tale of the latest goings on in Armadillo Acres, the home of Jeannie and Norbert; she's an agoraphobe and he's a toll collector and their baby was kidnapped 20 years ago. Norbert(the angelic-voiced David Benoit) takes up with an exotic dancer named Pippi who's fleeing a love-struck magic marker-sniffing cowboy named Duke. Then it gets complicated. Paul Daigneault directs with abandon and feeling--he never abandons these characters and consequently we have actual feelings for them. And the stagecraft is as impressive as the vocal artistry. There's the rollicking "Road Kill,"
the poignantly-pitched "Flushed Down the Pipes,"and the truly lovely "Owner of My Heart." Hitch your trailer to this mad funny production and drive yourself into hysterics. PRINCE OF PERSIA AND YOU ON THE RED CARPET!